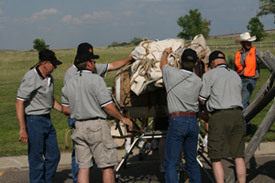 The Wyoming Game Wardens Association was formed in 1973 for the purpose of furnishing a medium for good fellowship and loyalty to the Wyoming Game and Fish Department and fellow officers, effectively maintaining the wildlife resources of the State, promoting a more efficient and able force of wardens and to meet our responsibilities and problems collectively. The Association is classified as a nonprofit charitable organization for tax purposes. 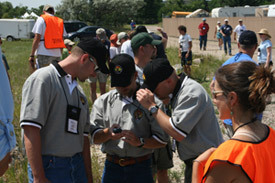 Since 1985, the Wyoming Game Wardens Association has had the ability to provide financial assistance to various charitable organizations, programs designed to enhance outdoor awareness to school age children, research designed to improve wildlife law enforcement, handicapped hunter assistance, scholarship programs and memorial funds. Total contributions have exceeded $400,000 since 1985. All commissioned wildlife enforcement officers in the Wyoming Game & Fish are allowed to be active voting members. Membership dues are $204/year. The Association has direct deposit setup so members can deduct $17/month from their paycheck. USFWS agents and Outfitter Board investigators in Wyoming are allowed non-voting membership at a reduced rate. 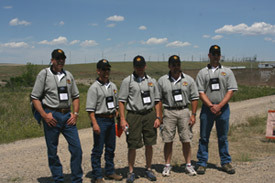 Retired Wyoming commissioned wildlife enforcement officers are active voting members and are exempt from paying dues. 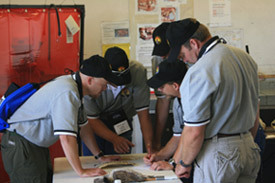 Non-law enforcement WGFD administrators and Game & Fish Commissioners are exempt from dues and are non-voting members. 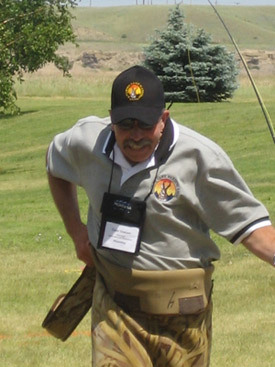 Dues fund WGWA and individual memberships in North American Wildlife Enforcement Officers Association and the Wyoming Peace Officers Association. Magazine subscription to the International Game Warden and the WPOA magazine are included. Dues also fund the annual membership meeting/banquet and training programs at the meeting, Certificates of Appreciation, retirements, WGWA Officer of the Year Award and travel expenses, WGWA Non Law Enforcement Person of the Year Award, and legal advise from the WGWA attorney. There is a $500 minimum death benefit to the surviving family for active commissioned wildlife law enforcement members, in addition to the $2,500.00 death benefit from NAWEOA and $500 death benefit from WPOA. These operating funds are supplemented by sale of WGWA merchandise and raffles. 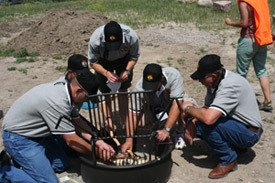 Along with member benefits to wardens in Wyoming, the Association contributes heavily to the youth of Wyoming. Utilizing the sale of limited WGFD Commissioner hunting licenses, the Association funds the following yearly programs. Wyoming High School Scholarships – Fourteen $400 scholarships are provided to graduating seniors in Wyoming high schools. The Association places no stipulation on areas of higher learning and bases the awards mainly on financial need and desire of the student. Annual Kids Fishing Days – Yearly fishing days are scheduled around the state to provide disadvantaged kids the opportunity to fish. The kids are treated to a cookout, boating, fishing poles, bait, licenses and patient warden instruction on finer fishing techniques. 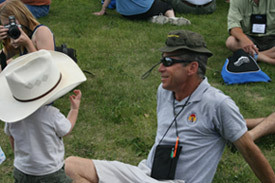 Hunter Mentor Programs – The Association provides financial support and manpower to teach kids safe hunting techniques, animal habits, and hunting techniques. The kids are also guided by adults in various hunts in an effort to get the kids interested in hunting. 4-H Shooting Sports Programs – The Association provides financial support to the 4H for their youth shooting sports programs. WGFD Hunting & Fishing Expo. Memorial funds for wildlife officers killed in the line of duty. 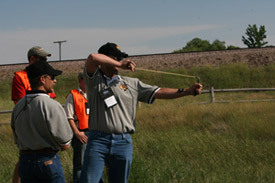 Law Enforcement Research Grants at the University of Wyoming. 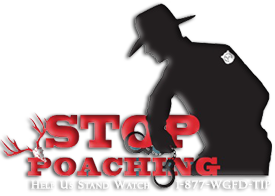 Stop Poaching Program – Contributing to the Poach Coach and Trailer, Posters, Calendars and Junior Game Warden Badges. The Association also reviews and comments on Department policies affecting law enforcement, overtime, budgeting, etc to receive the best possible Department action relating to wildlife enforcement. WGWA was largely responsible for availability of PILOCT/BEE compensation and the A13 warden coordinator positions. The Association also sponsors at least one wildlife legislative statute each year. From LE retirement benefits, Interstate Violator Compact, Restitution, Forfeiture, etc., the WGWA has been responsible for many major statute changes benefiting wildlife law enforcement and retirement programs. The President and Vice President are elected annually by the membership at the annual meeting. Each is eligible to serve for two years. The Secretary and Treasurer are appointed by the President and approved by the membership. The Board of Directors includes one director elected from each of the seven wildlife regions in the state from the officers in that region. These terms are for two years. At the annual meeting, usually held the late March or early April on one weekend, the Association pays for the banquet and babysitting fees for the attendees and spouses. In 2007 the membership voted to allow Associate memberships to the WGWA. Associate membership to WGWA is open to all individuals upon recommendation of a voting member, approval by a majority vote of the Executive Committee, and paying annual Associate Member dues. Associate members may be removed from membership by a majority vote of the Executive Board. Associate membership dues are $60/year, which runs from January thru December. If you would like to become a supporting member of the Wyoming Game Wardens Association, please fill out the Associate membership form and submit it with your dues payment (either personal check or money order made out to WGWA).